The ATS Slick Front Chest Harness was made at the behest of an active duty Soldier. The SFCH is patterned on the very popular Modular Chest Harness but without the built in magazine pouches to allow the user to configure the harness as his needs dictate; a useful feature for multiple weapon systems that don't use interchangeable magazines. The SFCH is about 22 inches wide and about 8 inches tall. It covers 7 rows and 14 channels of MOLLE space. It shares the same map pocket that the MCH harnesses have, which is about 10 inches wide and about 8 inches tall. 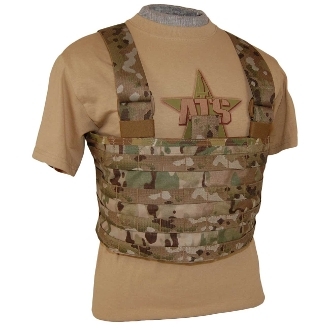 The ATS MCH Hydration Carrier and Modular Padded H Harness are both compatible with this rig. ATS builds them from 500D Cordura so the harness weighs just over 13 ounces. 100% made in the US of A of the best quality materials and is covered by ATS's lifetime warranty against manufacturer defects.